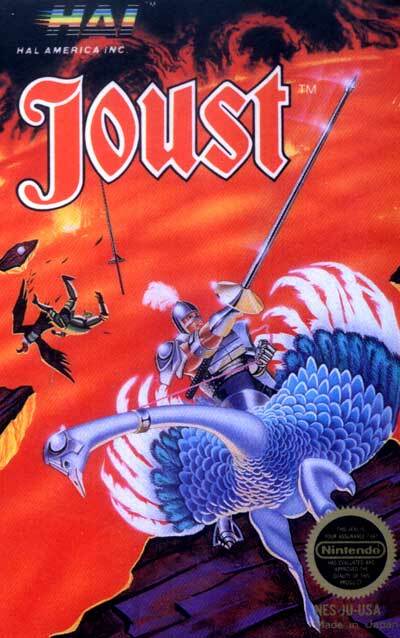 The player takes the role of a knight with a lance, mounted on an ostrich, battling waves of computer-controlled enemy knights. The enemy knights have three different speed and agility levels and are mounted on large, vulture-like creatures of their own. Second players were mounted on white, stork-like birds. The game screen is static; its only features are five platforms hanging in mid-air (some wrapping around the screen), the ground, and a pit of lava below. The game's incredibly simple controls are a factor in its wide appeal. A joystick moves left and right, and a "Flap" button flaps the mount's wings once. Pressing "Flap" in rapid succession will cause a gain in altitude until gravity drags the player downward.